Create a focal point in your garden with the Arboria Hampton Cedar Landscape Screen. This classic garden screen offers privacy and adornment, for the discriminating landscaper. Alternating small and large squares form the lattice on this screen, offering privacy as well as lending a dramatic feel to the item. The slightly rounded top contrasts the rectangular shape of the wood planks, for more interest. Create vibrant patterns in the garden by weaving your plants through the gridwork as they grow. Place this screen in the ground using the two included 36" steel stakes, and group several of them together for added effect. The western red cedar construction creates a sturdy item, and the natural oils in the wood will repel insects and fungus for a lasting screen. 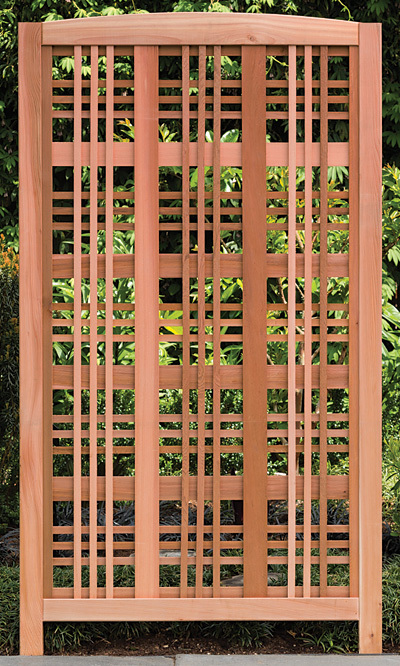 Make your garden into a private retreat using this Hampton Cedar Landscape Screen. Made in the USA.